From the moment you step into our office, you'll be welcomed with a friendly greeting and a smile. Beyond providing exceptional dental care, we aim to provide the most comfortable and friendly service for you and your family. Our team of experienced professionals is dedicated to improving the health and development of children and adults of all ages. The Dentistry for Children and Families team understands the importance of a healthy mouth and beautiful smile, and we will assist your child in achieving complete oral and overall health. We'll take the time to listen and address any of your concerns, and explain your treatment recommendations in detail. We have extensive experience with children of all ages and those with special needs. 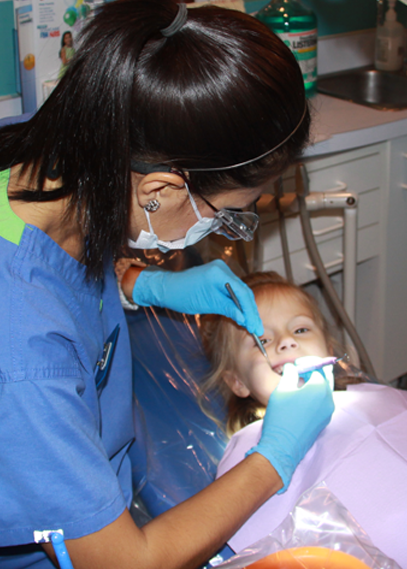 At Dentistry For Children, it all starts with a smile! Dragana Sarenac graduated from Rock Valley College with an Associates of Applied Science Degree in Dental Hygiene. She has been a part of the Dentistry For Children team since 2007. She was drawn to the field of dentistry because she wanted to assist patients in developing and maintaining exceptional oral health that contributes to overall health. Dragana's favorite part of working at a pediatric dental office is working with children, and seeing young patients leave with a smile after having a pleasant experience. Dragana enjoys working at Dentistry For Children because the doctors and staff go above and beyond industry standards to provide the most complete care possible. Dragans says, "Our focus on growth and development and the way that we incorporate nutrition really sets us apart from other chicago pediatric dentists."